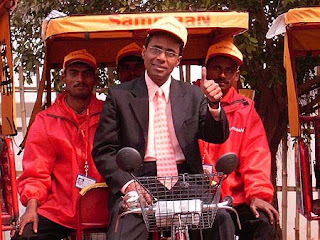 Let me tell you this man from Begusarai and an IIM Ahmedabad product is the Chairman of Sammaan Foundation, which works for uplifting the living and working standards of poor rickshaw wallas. 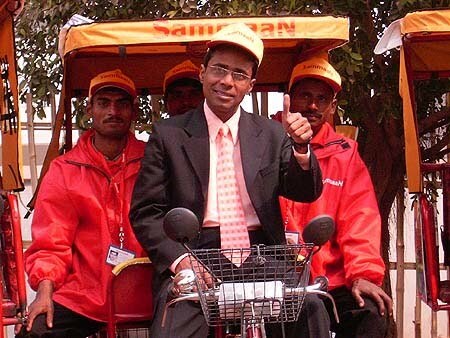 After completing his education he could have earned a lot by taking up a job as a manager in any good company but he started Sammaan in 2007 with around 100 rickshaws and today he has around 3 lakh pullers registered under him. Sammaan is active in seven states and still growing. The states are Bihar, Jharkhand, Delhi, Rajasthan, Madhya Pradesh, Haryana and Uttar Pradesh. He wants to cover 10 million rickshaw pullers, who in search of employment come to cities and start pulling rickshaws. He wants to uplift the condition of these poor fellows. His idea was to systematize the working of all rickshaw pullers by bringing them under one roof. According to him, in India there are unions for everyone except rickshaw pullers, so he took their cause and modernized rickshaw pulling sector (rickshaw pullers comprise 30% in urban transport). His efforts bared fruit and rickshaw pullers started to earn more due to his efforts. 1. He offered them rickshaw at a nominal rent (Rs. 10 -20 depending upon cities). Earlier these pullers used to pull hired rickshaw for Rs 50 per day. Now by paying a nominal amount they started saving a large amount. 2. He got banks to offer them loans, initially he invested 10 lakh rupees to start this and as he became popular, funds started to flow. As pullers started to earn more they are now in a position to pay their installments. 3. He designed new rickshaws which have shelves which can carry newspaper, mineral water, and other small items for sale such as mobile recharge coupons, courier collections, bill collections and payments, etc. To make the ride more comfortable and entertaining he provided them with music, magazine, first aid kits and thus transformed this into a marketing engine. 4. He provided rickshaws with advertisement. He designed the rickshaw in such a way that it provided ample space for ads. The revenue of which is divided equally between the puller and Sammaan. This adds to the income of the rickshaw puller who earns from ads and the sales. 5. For purpose of designing, he established a fully fledged R&D center in Patna, for this purpose he has employed 3 engineers and more than 15 workers who work so as to bring innovation in rickshaw models so that they become more profitable and user friendly. 6. Besides these benefits Sammaan provides free uniform to all registered pullers, and a saving banks account from the day they are registered. 7. They cover accidental insurance amounting to Rs 1 lakh to pullers and the commuters. 8. Provides books to their children and conducts evening classes for pullers and their children under the social program “Sammaan Gyaan”. 9. Gives training in occupational skills to the wifes of operators, such as embroidery, stitching and tailoring. 10. They share a part of the income earned through value added services with the pullers, thus maintaining ethics. Now with his hard work and dedication this 30 year old, young entrepreneur has showed the world that if you have vision, you can achieve the unachievable. Now as he is reaching heights his clients are also increasing and big names such as Punjab National Bank (PNB), HT, Bisleri, Bharti Airtel, Dena bank etc are joining his corporate social sustainability model. His next plan is to register all rickshaw wallas across the country under Sammaan, providing new and improvised rickshaw to all, currently only 10,000 rickshaw pullers have special Sammaan rickshaws. With the help of PNB he is providing low cost housing for rickshaw pullers for 1.5 lakhs, carbon trading opportunities and a public offer by 2012. The company has 400 percent growth this year and with Irfan visiting Washington; his corporate social sustainability venture will definitely become more popular and hence the effect on its turnover. We salute this youth icon, in a true sense.